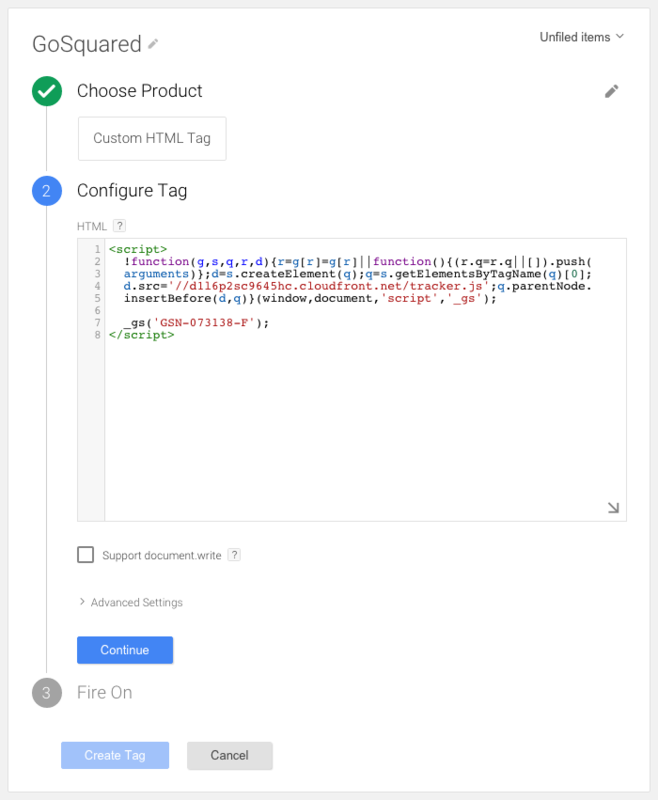 Google Tag Manager (GTM) is an easy way to manage multiple scripts and services running on your site. GoSquared can be added you your site using GTM and this guide will walk you through the steps needed to get everything set up. Note: GTM currently only supports GoSquared Analytics and GoSquared Live Chat. If you haven't already, you'll first need to sign up for a free GoSquared account. This sign up process walks you through the Setup Guide. You'll need to select the Install on your site option. Just leave this page open for the time being and we'll come back to it later. If you already have a GoSquared account you'll need to use the project picker to choose the project you want to use GTM with first. Next log into your GTM account and select the container that you want to add GoSquared to. Give the tag a name by clicking on the pencil next to 'Untitled Tag' (in this example we've called it GoSquared). Ignore the list of suggested products and click the 'Custom HTML Tag' button. A 'Configure Tag' box will appear, this is where we put the GoSquared Analytics code. Copy the code from the Setup Guide we left open earlier and paste it into the box (This code is unique for every site). It should look something like this. Ignore the other settings and click Continue. Next click 'Fire on all Pages', then click 'Create Tag'. You now need to publish these changes to the container by hitting the red 'Publish' button in the top right of the page. Confirm this by clicking 'Publish Now' in the box that appears. Visit your website and refresh the page and this will cause GTM to load the GoSquared tracking code. Now you've finished the GTM configuration we can finish the setup process within GoSquared. Go back to the Setup guide to check your installation is working. Once you've passed the Installation checker, your done! You can also go a turn Chat on by clicking on the Inbox tab in the GoSquared sidebar. Thats it! 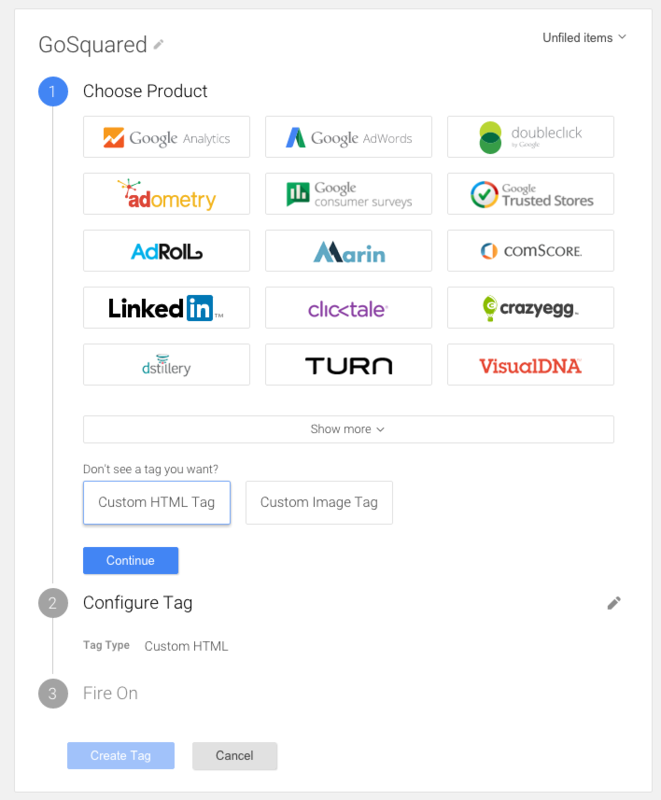 GoSquared should now be working with your Google Tag Manager. You may see a page in your Content widget called 'gtm-msr'. This is an unfortunate side effect of using GTM. GTM uses an embedded iframe to load its tracking code. On some dynamically generated websites this iframe can be loaded multiple times which GoSquared counts as pageviews to a new page called gtm-msr. We are currently investigating a way around this issue.